Inside your new Riverstone Apartments home, you’ll enjoy first-rate amenities designed with your lifestyle in mind. Create meals for the family in your gourmet kitchen with modern appliances. You’ll love the easy-to-clean vinyl floors and granite-style countertops. For your convenience, we’ve included a dishwasher and gas range in every home. Oversized floor plans and ample storage space make it easy to arrange your furniture and organize your belongings just how you like them. Discover all this and much more in your new Bolingbrook, IL, apartment home. Experience the very best in apartment life at Riverstone Apartments. Our deluxe clubhouse is the center of activity here and has something for everyone. Get fit in one of the modern fitness centers. Host a movie night in the theater room. Let the kids play in our fun-filled activity room. For your convenience, the clubhouse also has a large business center, complete with conference room and work space. 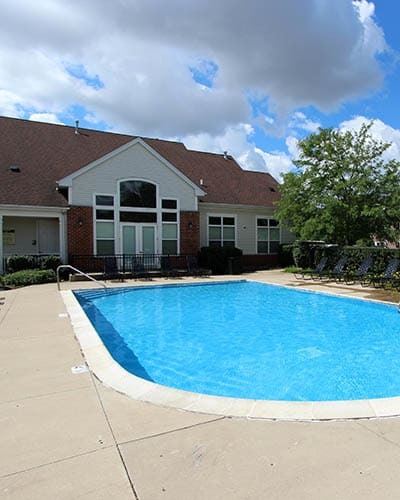 Outside, enjoy professionally landscaped gardens, heated pools, and a sand volleyball court. Our pet-friendly community even has an on-site dog park for you and your pets to enjoy. Come home to deluxe amenities throughout the Riverstone Apartments community. Browse our floor plans and schedule your personal tour today.